Needles in Public Spaces: Where Are They Coming From? You are here: Home / Needles in Public Places / Needles in Public Spaces: Where Are They Coming From? Follow the water capsules and cookers given out in Injection Kits. With over 10,800 needles reported found in public spaces in Santa Cruz in 42 months, people naturally wonder where these needles are originating from. Are the Needles Coming from the County’s Syringe Services Program? Unfortunately the needles that the SSP (Santa Cruz County “Syringe Services Program”) gives out have no distinctive markings, and the County has indicated that it is unable to mark them for tracking purposes. However, many needles that have been discarded in public spaces have been found with other “needle kit” items given out by the SSP, such as water capsules, antibiotic ointment, antibiotic wipes, cookers, and tie-offs. Neighbors around the SSP also report an uptick of needles found in the neighborhood after the SSP was relocated to Emeline in April 2013. 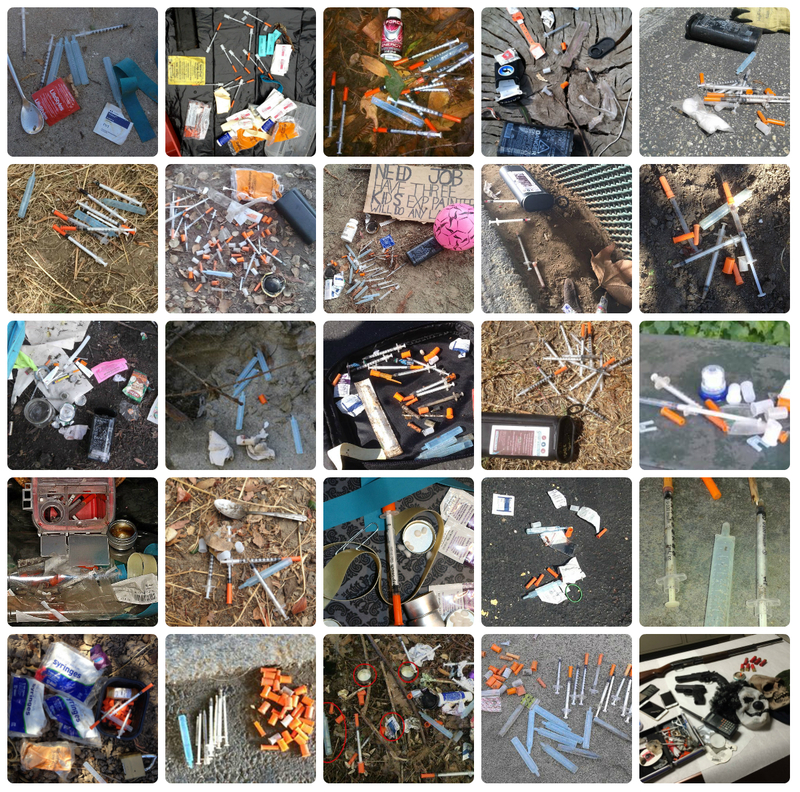 Based on these facts, it is reasonable to conclude that many of the publicly discarded needles have come from the SSP. Are the needles coming from pharmacies? There are some local pharmacies that sell syringes without a prescription. However, there are only 8 pharmacies in the County that sell needles without a prescription, and just two within the City of Santa Cruz. A survey of pharmacies done by Needles Solutions Team volunteers in December of 2015 revealed that none of these pharmacies dispense water capsules. Since some needles found do not match any of the various types of needles given out by the SSP, there are presumably other sources of needles. There have been instances of drug dealers busted with needles pre-filled with heroin. What About the County’s Claim That The SSP Takes In More Needles Than it Gives Out? Take Back Santa Cruz’s Needles Solutions Team finds this claim questionable, for several reasons. The SSP’s answers to questions about how needles are “counted” for exchange purposes, and whether or not sharps containers are open for inspection, have been inconsistent. Furthermore, the Needles Solutions Team has interviewed several former SSP clients (now in recovery) who say that they were frequently given a fresh starter pack of needles on repeated visits despite having none to exchange, while others say clients regularly brought in sharps containers that contained debris other than needles.